Want to dress like a Victorian lady for a party or re-enacting event? Making a Victorian hat can be a fun and simple project. 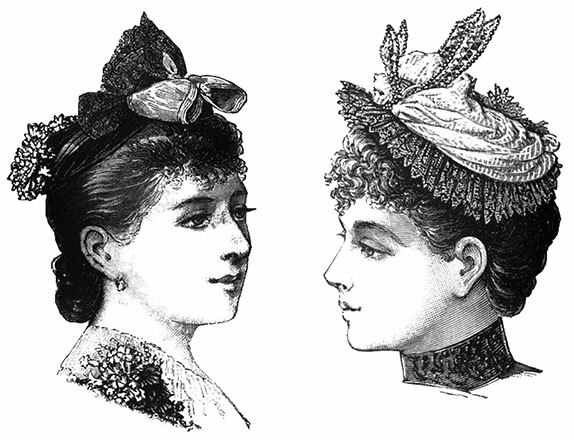 The elaborately trimmed bonnets, hats, and toques worn during the Victorian era were not always purchased from a department store or catalog, but frequently made by women at home. 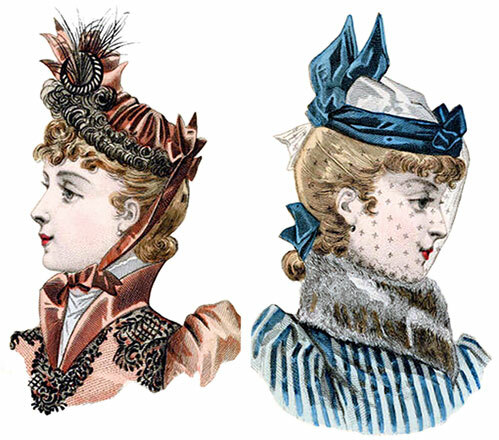 Mail order catalogs offered wire frames or unadorned straw bonnets to embellish and trim; furthermore ladies’ fashion magazines often featured directions to design and decorate a Victorian hat at home. 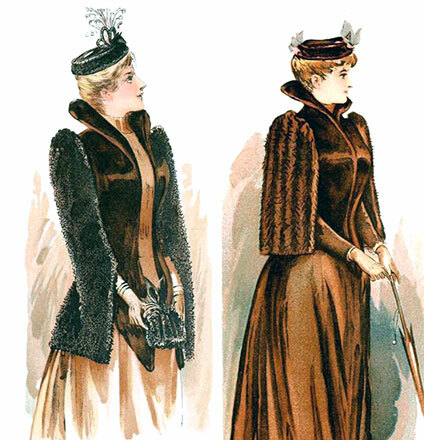 Featured here are instructions for how to make a Victorian hat from 1890. 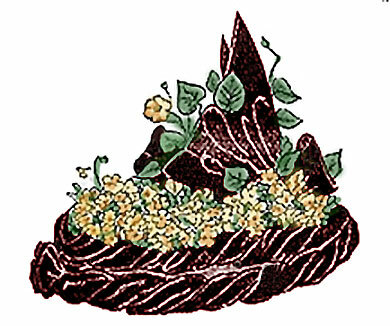 In 1890, flowers formed the chief trimming for both hats, bonnets and toques. Favorite colors were shades of heliotrope, bright scarlet, green and amber. Among the flowers introduced were violets, single and Neapolitan, pansies, lilacs, cowslips, roses and forget-me-nots, the latter being a good deal used with moss-green velvet and tulle. The Victorian toque was a small brimless hat with a soft close-fitting shape could be trimmed in various ways. Some hats featured flowers, while others were emblellished with satin ribbon, feathers, beads, or netting. Some very dressy hats are made with the rouleaux of contrasting shades. One is in exquisitely soft tones of green and helitrope velvet, with pansy wreath and spray. 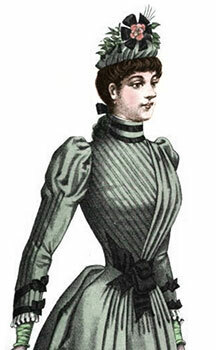 One 1890s magazine featured a pretty hat with rouleaux of green velvet, and in place of flowers a jet coronet above; on another, fans of black lace and a jet butterfly finished the crown. 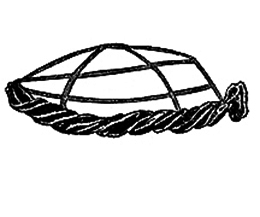 The shapes for these hats are made of ribbon wire or round wire; the former is preferable, as it holds the stitches best. The Victorian hat featured above can be made with a roleaux of velvet ribbon or a piece of velvet joined in strips and tightly twisted. A wreath of flowers is arranged to fall over the second roleau, the center of the crown being finished with a spray and bow of ribbon velvet. Any of the flowers before mentioned are suitable for this hat, and are suitably combined with black ribbon velvet, while coronets, sprays and clusters of flowers can be purchased ready mounted for use. Colored velvet, if the flowers are nicely blended, is also a good choice, as for instance, brown velvet with pink flowers, forget-me-nots with a soft shade of olive green, pale violets with deep violet velvet, etc. The Victorian flower toque is made on a wire shape that can be crafted with milliner’s wire. 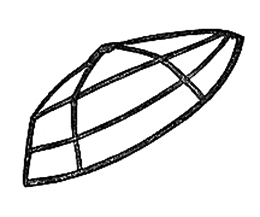 An alternative is to purshase a basic hat frame to be embellished. Flower toques are very simply made. Begin by covering the wires neatly with velvet, ribbon or anything handy. In doing this, take all long stitches on the outside of the shape; there will be no head-lining, and the inside should be kept as neat as possible. Now twist the velvet on the shape to form the first twist or rouleau. This will take one and one half yards of ribbon velvet. Begin from the back, and try to make the twist as soft and careless as possible; to look stiff will spoil it. Do not turn the velvet over the wire inside the shape; this takes up the room inside the crown, but twist it over and over entirely on the outside, and sew firmly here and there between the folds to the wire. Show as little as possible of the satin back of the velvet, and when twisting over make a pleat in the under-part of the twist which comes next the wire; this helps to make it fold looser. At the sides the velvet should fall over the shape from about three fourths to one inch, at the back not quite so much. In front, a pretty finish is made by forming the velvet into three short loops to stand out a trifle from the shape. The center loop must, of course, come exactly in the front. 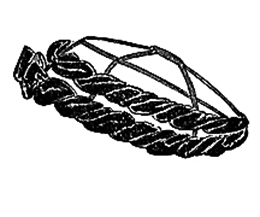 The second roleau or twist is formed in the same way, but without loops in the front. When this is done, catch the top part of these loops to the upper roleau so as to keep them in place. Now arrange the wreath, which should not be too wide, and looks best if a little higher and fuller in the front. Let the wreath fall a little over the upper roleau, and sew it firmly here and there to the third wire. Look at the illustration while arranging the flowers; you will see that they stand up nicely above the crown all around; at the back the wreath is, of course, quite narrow. Next, sew on the spray, which should be mixed with foliage. It is sewn on towards the back, some of the flowers to stand up high, while others bend towards the front. 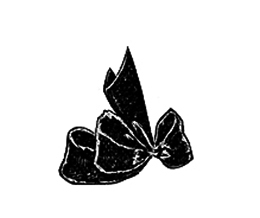 Make a stylish bow of ribbon velvet, like the illustration, using about three-fourths of a yard. Fishtail the end and double it over a trifle, pleat the loops tightly at the base, and twist the cotton around and around several times after sewing, to make them stand up. 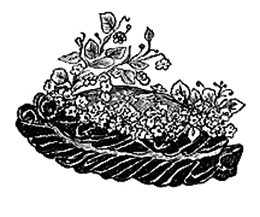 Refer to the illustration of the finished hat, and sew this bow on the back of the crown, let the loops mix in prettily with the flowers in the spray, the two sloping towards the front. Catch them down to the wires crossing the crown, but only sew them at the extreme edge, and be careful not to flatten them. Catch the high part of the spray to the ribbon velvet and about half way down. Lastly, pull out the flowers and make them look as graceful as possible.